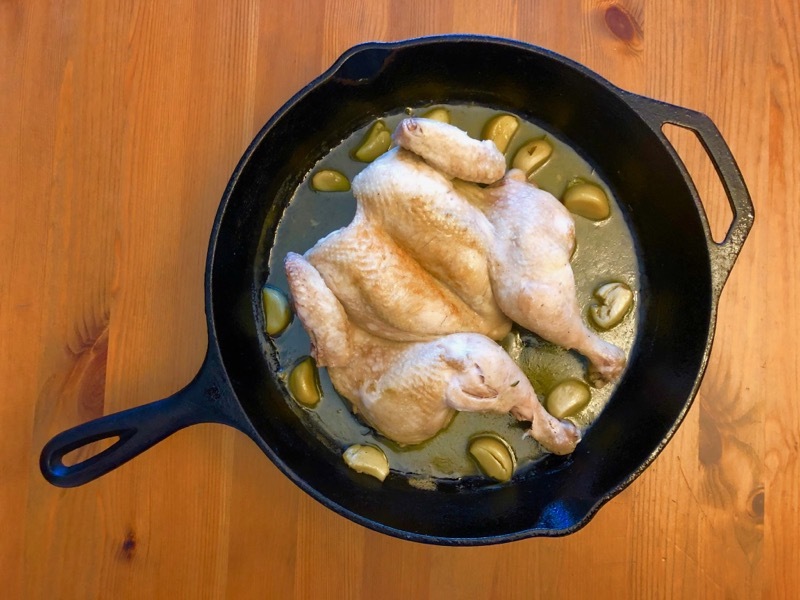 Want to cook a whole chicken for a weeknight meal with only ten minutes of actual work? Need an excuse to drink better than a half bottle of white wine? This is the dish for you! Spatchcock the chicken by using poultry shears to remove and discard the backbone. Open the chicken up with the legs turned in. Sprinkle half the salt on the cavity side. Turn the chicken skin-side up and sprinkle with the remaining salt. Place a large, deep frying pan with lid on medium heat. When the pan is hot, add the oil. Place the chicken in the pan skin-side down for five minutes. Turn chicken skin-side up. Add remaining ingredients to the pan and cover. Turn heat to high to bring to a boil. Reduce heat to just maintain a simmer (approximately medium-low). Cook until the chicken reaches 75C at its thickest point (approximately 40 minutes). Remove chicken from the pan and set aside to keep warm. Discard the thyme sprigs and garlic peels. Bring pan juices with garlic to a boil until slightly reduced and thickened (approximately five minutes). Remove from heat, return chicken to pan and serve family style.